Soon I’ll be having soy in my coffee. 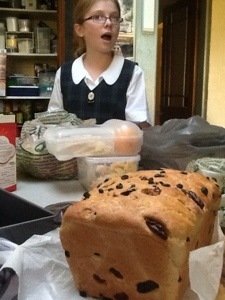 Yes, I made spelt bread. But I have a good excuse. I have a tetchy tummy and it has been suggested to me that I may benefit from the low FODMAPS diet put out by Monash University specifically for those of uncertain digestion. I had a look, and it certainly had quite a few foods on its naughty side that I have a lot of problems with. Specifically stone fruit, dairy products and lentils and pulses. You hear a lot of people carrying on about dairy being the root of all evil, but when a dietitian tells you to lay off the lentils I pay attention. Those things are lethal. It didn’t fit my sensitivities exactly, there’s no way I could eat grapes, beef, mandarins, porridge or bananas without suffering the consequences, but it did suggest substituting spelt bread for wheat bread. I’ve always had a niggly feeling that gluten might be a bit of an issue for me, but it’s such a bandwagon! I’d feel so silly giving up gluten. As it turns out, spelt isn’t gluten free but it’s a different type of gluten that may be tolerated better by guts such as mine. Worth a shot, I thought. I found a relatively simple recipe on taste.com. You dissolve fifteen grams of fresh yeast (or a seven gram sachet) in a cup and a half of water. Add a cup and a half of white spelt flour and a cup and a half of whole meal spelt flour. Also a tablespoon of olive oil, a couple of grinds of salt and a tablespoon of sugar. Knead, but not nearly as much as you would a wheat loaf. I found this combination to be way too wet, so added perhaps a quarter of a cup more of the white flour. It was still quite wet, but I thought it would do. I washed and oiled the bowl and shovelled the mix back in. 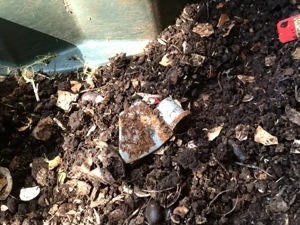 I covered it with a damp tea towel and took it out for a lie in the sunshine on the trampoline. I wonder why our trampoline has a burn hole in it? After about forty five minutes it had almost doubled in size, so I punched it about and massaged it into a lined loaf tin and left it in the kitchen while I went to Drummoyne. Drummoyne took a bit longer than I thought it would. I’m planning a new bathroom and got into quite a technical chat with the proprietor of the bathroom shop. Did you know you can get floor tiles that look exactly like wood? And it’s very difficult to get a toilet that is any colour other than white these days, not that I’m terribly attached to our current peach coloured model. So by the time I got back with a sheaf of brochures the loaf had over risen a bit, so I got it straight into the oven. The rising times seem to be less than for wheat. I baked it on 220 degrees for fifteen minutes, then 180 degrees for another twenty and left it in the turned off oven while I went to pick up the Horror from Outer Space from his institution. 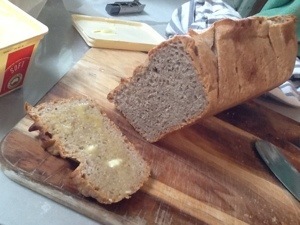 The crust looks very good, and the thin slice that I’ve tried with a bit of butter was more than acceptable. 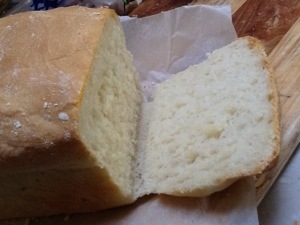 I thought that because it hasn’t risen as much as a wheat loaf it may be a little dense, but it isn’t. I think I can comfortably fool myself that this is bread and not some kind of hippie rabbit food. I plan on not telling the man of the house, he’s fairly unused to whole meal bread so will probably not notice. The recipe actually suggests messing about with adding linseed and decorating with flakes of oatmeal, but I didn’t bother with that. I don’t mind a linseed in whole meal bread, but I don’t have any. Maybe next time. I do appreciate that everyone is entitled to holidays, even the hard working Vietnamese couples that slave away at all hours of the day and night at our local hot bread shop. I hope they’re having a lovely time. What I should have done is to buy a whole lot of bread before Christmas and stuck it in the freezer, not that there would have been any room with all the ice blocks I was making. But I didn’t, so here we are with no bread. Oh, yes, I could go up to the nearest mall because Baker’s Delight doesn’t go on holidays, but then the Horror will want to come too and he’ll want a milkshake and a surprising amount of sushi and then I’ll have to have a coffee to cope with him and then a loaf of bread will have ended up costing me thirty dollars. I’m going to have to make it myself. 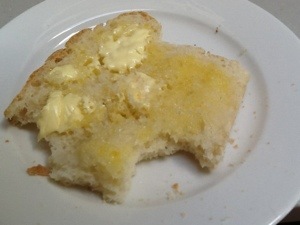 I have alluded to this method of making bread when I was chatting about cheese and bacon rolls a while back. It isn’t a method that requires a whole lot of kneading, but you do have to stay a little focused, otherwise you get the risings all wrong and you end up with a loaf that looks like a depressed Frenchman. This method comes from that monumental tome, The Cook’s Book. Place in a bowl twenty grams of fresh yeast with three hundred and fifty grams of water. Squash up the yeast with a fork until it’s dissolved. Add five hundred grams of flour and about ten twists of the salt shaker. Mx it all up with your hands until the flour is incorporated, then cover it with a damp tea towel and go fold sheets for about ten minutes. Pour a slug of nice olive oil over the dough and knead it in. Go pay a phone bill or two. Repeat with the olive oil and the ten minute pause until you’ve done it three times. 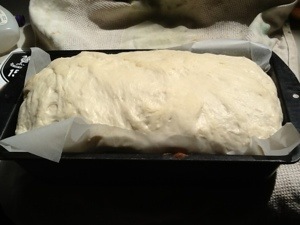 Leave the dough covered in a warm place to rise until it has doubled in size. This is very dependent on how warm the spot you’ve left it in is. Often I put it in the oven with just the light on, but today my oven is occupied with ginger nuts, so I’ve placed it in the square of sunlight that comes through the kitchen skylight and moves like a laser beam through the room during the afternoon, melting everything in its deadly path. Once it has doubled, punch it about a bit and manhandle it into a loaf tin that has been lined with baking paper. Leave it again, covered with a damp tea towel, until it has doubled in size. 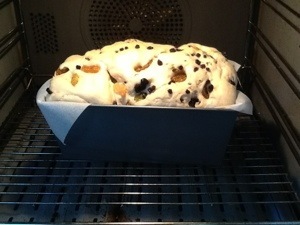 For my sized tin, this is when it’s doughy shoulders have just risen above the sides of the tin. You put it in a hot oven, about two hundred and twenty degrees for fifteen minutes. You can mess about with brushing the top with water and slashing it with a sharp knife, but nobody really cares about that kind of stuff among my consumer base. Drop the temperature to one hundred and eighty degrees Celsius and bake it for a further thirty to forty minutes, but keep an eye on it. 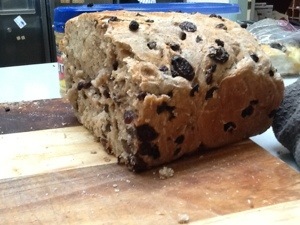 It should be all brown and crusty looking on top and sound hollow when you, feeling slightly foolish, knock on its top. 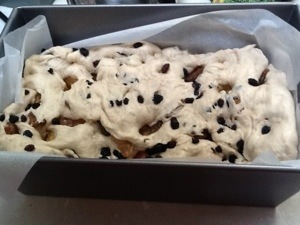 Once it’s out of the oven, lift it out of the tin by the baking paper, otherwise it’s sides will get damp as it cools. My grandma says you shouldn’t eat bread the day it’s baked, it’ll give you a tummy ache. I defy you to try abstaining from chopping off the end of your loaf and slathering it with butter and possibly Vegemite while it’s still warm. I’m willing to risk a tummy ache. If you’re going to be watching Rush Hour 7 with the family on a Sunday night, what you need for dinner is pizza. One problem with making the bases yourself is that once you’ve done it once, your family won’t accept shop bought again and they’ll even get a bit fussy about which pizza restaurants they’ll eat in. Fortunately our suburb abounds in excellent pizza joints, but I’m certainly not dragging myself out to pick some up, not wearing this ankle brace, even if it is now adorned with a fur cuff. Easier to make your own. This is a forgiving recipe and will turn into pizza bases even if you start the whole thing with an hour to go. It’s better to start it earlier in the day for the yeast to do its thing, so whenever you get a moment. In a bowl place eight grams of fresh yeast, three hundred grams of water, ten grams of sugar and five hundred grams of flour, half of which should be farina per pizza if you’ve been to the deli recently, which I haven’t, so it isn’t. Mix it all up. My yeast looks like it’s on it’s last legs, I’m going to have to get up to the IGA this afternoon and fork out another sixty cents for some fresh stuff, but it doesn’t matter for this recipe. Grind some salt over it and slosh a bit of olive oil on it, then knead it in. Every ten minutes or so, repeat with the oil maybe three times. Then leave it alone with its thoughts for a few hours. If you’re looking for international pizza certification you use less yeast and hard flour and it should rise over at least twenty four hours. That’s nice to know, isn’t it? Moving on, once it has risen a bit start pinching off bits and rolling them into circles. I go with a chunk that’s a little smaller than a tennis ball, that works for a thin crust on the pizza trays I have. You can use baking trays if you haven’t got pizza trays. 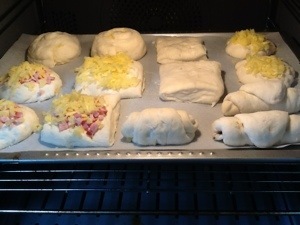 Let these rise for a bit, and if you haven’t got the bench space, stack them separated by baking paper. I rarely manage this step, but it’s nicer if you get it in. Spray your pizza trays or what have you with olive oil spray and sprinkle with cornmeal. Heat your oven to about two hundred degrees Celsius, and if you’ll be using a pizza stone, you should have done this half an hour ago, come on, the natives are getting restless. I do have a pizza stone, they’re only about fifteen bucks and they make a nicer pizza, but you can only do one at a time and I like to circumvent that who’s pizza is coming out first argument by putting three in at a time. Then there’s toppings. Salami or bacon and cheese for the Horror, tomato paste and cheese for the Muffet and for the Moose, salt. I do seem like the type to grate my own cheese, but have you ever tried to grate mozzarella? It’s very squishy indeed, so I buy a pregrated pizza cheese mix. These bases also make a very nice flatbread, which is how the Moose eats it, so I often roll out a baking tray full and he’ll take it for lunch the next day. The grown ups get tomato paste, pepperoni, mushroom, celery and capsicum, anything that’s not wet. Fresh tomato on pizza is a bad idea, it makes it soggy and burns your mouth, leave it off. My favourite pizza is goats cheese, baby spinach, mushrooms, cauliflower, pepper and celery topped with cheese, but that’s a bit girly for my husband, so sometimes we get a different one each if we’re very hungry. 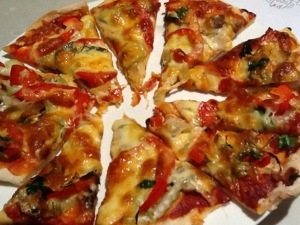 This recipe makes between six and eight 25cm pizza bases. It turned out that the DVD was covered in someone’s sticky fingerprints, so we never did find out if Chris Rock managed to keep his eyeballs in for the entire movie. Great excitement in the house of muttering, the Muffet’s school social is on tonight, and there’ll be boys. Not that the Muffet is too fussed, she gets way too much boys at home, that’s why she likes going to a girls’ school. She’s bringing home Lindy Lu so that they can spend the afternoon giggling and doing each other’s hair in preparation. They’ll be hungry. The boys both have sport today, they’ll be hungry too. I think cheese and bacon rolls are in order. This is yet another idea I got from the Thermomix demonstration, it’s the party that keeps on giving. Why did I never think of it myself, I’ve made my own bread quite a lot. 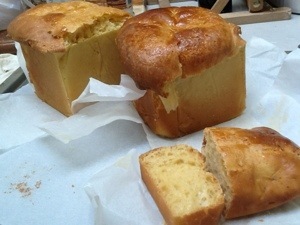 You need a loaf’s worth of bread dough, and you may have your own recipe for that. If you don’t, here’s what I do. In a metal bowl, place ten grams of fresh yeast, which if you live where I do you can purchase at the local IGA for about sixty cents for fifty grams. Dissolve it in 350 mls of water. If you remember any high school science you’ll know that the density of water is one kilo per litre, so you can just weigh it out. 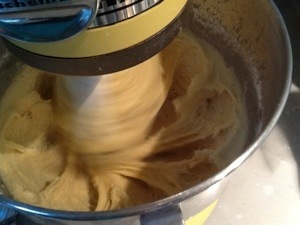 Add five hundred grams of flour and about ten turns of the salt grinder and mix it up. Cover it and leave it for about ten minutes, then come back, pour a teaspoon of olive oil over it and knead it in. Repeat a couple of times. Leave it until it looks about doubled in size. If you want to speed that up because it’s a cold wet day, put it in the oven with the light on. I’m still excited to have an oven with a working light, it’s just had its first birthday. Then dump it on to a floured bench top and knead it some more. You really don’t need to go overboard with the kneading, despite what you may hear. Just make sure it’s smooth and elastic. Roll it out into a big rectangle and start getting creative. I sliced off a couple of rectangles and pulled them out to be longer. Some of them I spread Vegemite on for the Moose who doesn’t like melted cheese. I know, I know. Some I sprinkled with chopped up bacon and grated cheese. some just cheese. If you’re a bit reckless with your shaping and actually start with a long triangle, when you roll it up it’s shaped like a croissant. I also did traditional cheese and cheese and bacon rolls with the stuff on top. Because I ran out of bacon, I also did some square plain rolls. Pop these back in the oven with the light on for about half an hour, or not if you’ve run out of time. Bake for about half an hour at 180 degrees Celsius. This way you can use nice Australian bacon rather than that alarming pink rubbery stuff you get up at James’ bread shop. That’s going to be a really nice smell to come home to.